We all know that dining is an essential part of travel, but sadly, small local deserts and other sweet snacks are usually off the radar, or at least don’t get the same amount of attention as the lunch-diner type of meals. For most of us, when we crave something sweet, ice-cream and chocolate based treats from big international companies work just fine in any part of the world. But, if you’re traveling to or through Senta, a small town in Vojvodina (northern Serbia) there is a place all you sweet toots shouldn’t miss, and it’s a candy store called Almasi (Almaši in Serbian). Why is this store special? Well, mainly because they specialize in production of marzipan. Marzipan is a generic name for candy product based on almond meal – this store still makes them in the traditional way. 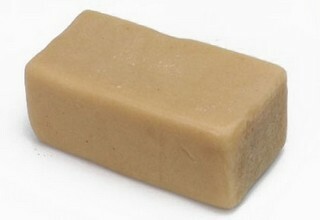 A single piece of marzipan weights around 30 grams, and has a very thick and sweet taste to it. They are formed in simple shapes like cubes or wheels and there aren’t many different flavors to choose between. It might not be trendy, but the owners stick to the traditional recipes. The price should range between 0.80 and 2 Euros per piece, but don’t worry – after few marzipans from Almasi, you won’t need anything sweet any time soon. It’s almost guarantied not everyone will like the rich taste, but those who do will remember it for sure. The address of Almasi candy shop is Sečenjev Square 3, Senta.